Last time they saved the Sheep God, this time the Warrior Sheep head to Las Vegas to save rams, ewes, and lambs everywhere from the strange monster called Red Tongue. The sheep have a mad scientist following them but that won’t stop them from saving everyone from the monster. Authors Christine and Christopher Russell are a husband and wife team writing children’s book together. 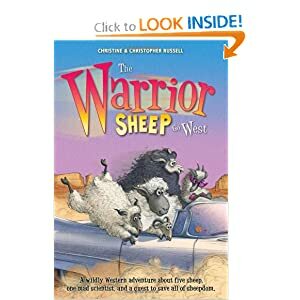 The Warrior Sheep Go West is their second book, following closely on the hooves of The Quest of the Warrior Sheep (February 2011). Christopher Russell had a successful career in British television drama before becoming a children's novelist and Christine has always been closely involved in his work. This book was hilarious! I was laughing out loud throughout the book and I know that you will as well. The five sheep in this book get into so much trouble, it is hard not to keep a straight face. The author continue his great character development in this book and you find as you are reading that you are connecting more and more to the characters! The other things that was good in this book was that the author keeps you in suspense until the very end! This is a great next installment tot he series and I look forward to ones to come!